As a Minority Owner (e.g. 20%), if the Majority decides to sell the NFT, I should still be entitled to 20% of the profit received. As a Shareholder, I would like to be able to freely adjust my stake in the free market / exchanges. Stakes into this ERC721 token under this scheme are ERC20 tokens. A multi-sig wallet does not offer this feature. It is the logical next step in the evolution of a decentralized financial system. In the traditional financial system, high value items are rarely solely owned by 1 person. Some concrete and easy-to-relate example use cases include representing an apartment co-ownership, selling fraction of an art piece, etc. A wallet with a protocol that allows safe buy-and-sell of NFTs, to-and-from individual owners and a group of owners. NFTs (ERC721) and their shares (ERC20) can be traded directly on DEX using 0x protocol in FNFT Wallet. 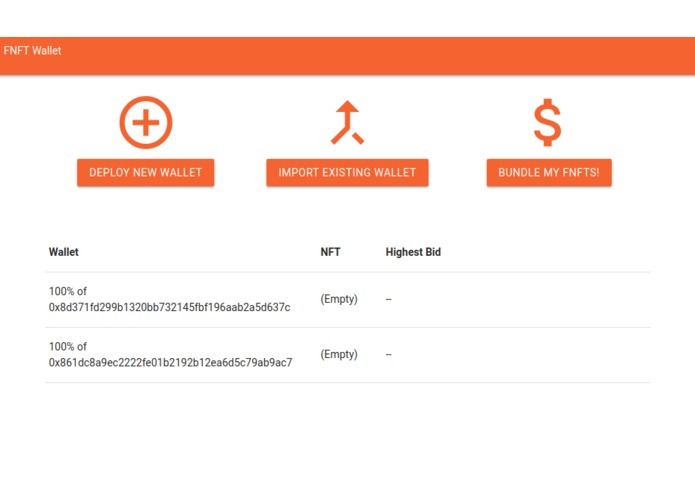 Create Set bundles of shares (ERC20) directly in the FNFT wallet. The whole ecosystem, including 0x Exchange contract, some ERC721 tokens and an instance of the FNFT wallet contract, has been deployed to the POA Ethereum Network testnet. Voting to take action for the NFT. E.g. shareholders vote on how an Etheremon should approach a battle.